Ontarioville Art Center (OAC) is dedicated to providing art instruction to ages 8 through adults from our expert faculty, and to providing a location for local artists to promote, show and sell their affordable original art to our surrounding area. Lessons are available in drawing, pencil, charcoal, pastels, colored pencil, watercolor and bead weaving jewelry making. 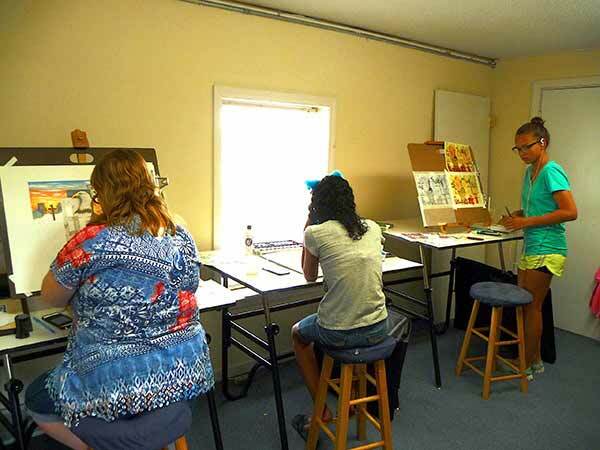 Our professional artists/instructors teach all the basics with a consistent format, providing each student with the tools to create beautiful works of art they can keep, or perhaps even sell. Click here for more information on art classes. Upon entering Ontarioville Art Center, visitors will see wonderful works of art on display on our first floor by local artists in a variety of media in our Gallery and Gift Shop. Pieces are reasonably priced so customers can add an original art piece that will grace their home for years to come. View original oil paintings of landscapes, floral, and still life from several local professional artists. Watercolor, colored pencil, oil pastel, and additional media are represented in the two dimensional works. We also have mixed media artists, including our wood carver, Gary Sieroslawski, who turns scraps of wood into beautiful collectable figures. In addition, you’ll find intricate jewelry creations by Sue Neel, our bead weaving instructor, plus additional ornaments, pens, earrings, bracelets, and other unique handmade gift items. Visit the Gallery page for information about the current artists on display. When you need a unique gift for that special someone who has everything, keep the Ontarioville Art Center in mind. Gift certificates available for art classes as well. To learn more about our art classes, or ask about exhibiting at our gallery, please email us or call 630-837-7484. Check out our class schedule for the latest offerings.